Organisations are readily adopting cloud-based services as a result of rapidly changing market dynamics and customer expectations. Matrix, represented in South Africa by Secutel, announced the launch of COSEC VYOM, a people mobility management solution deployed on the cloud. VYOM helps businesses achieve flexible time, attendance and access control solutions at multiple locations in different layouts and varied time zones. Traditional applications have proven to be an inadequate solution in catering to the needs of SMB and SOHO markets. With no initial investment, COSEC VYOM promises more with minimum resources. It reduces the cost of assets needed in the form of hardware, software and network devices. It is designed to provide cloud-based time, attendance and access control solutions that offer a range of options in attendance policies, integration and report generation. Scalability: VYOM is a modern age solution for complex organisations with multiple locations spread across geographic regions and operating in different time zones. It encompasses one million users and 65 000 devices. Intuitive: Managers / supervisors / employees can leverage the benefits of time, attendance and access control solutions with any Internet-enabled device(s) such as PCs, Macs, tablets and smartphones. 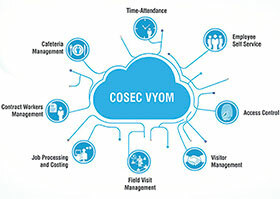 Cost-effective: With minimum cost, COSEC VYOM provides maximum gain as it requires no upfront investment. Moreover, it reduces the cost of assets needed in the form of hardware, software and network devices. Instant access to upgrades: VYOM is a smooth, independent solution that eliminates complexities of maintaining the server. It gives you the benefit of automatic regular software upgrades. Increased productivity: It automates all time, attendance and leave management processes right from recording entries to report generation through realtime updates. Easy integration: It provides flexibility to export attendance by seamless integration with third-party payroll systems. It also allows integration with third-party hardware such as video surveillance, turnstiles, boom barriers, tripods and more. People who live on farms and in rural areas are particularly vulnerable to armed farm attacks, where response times are lengthy due to the remote locations of the farms.